Clubs: their place in the past, their place in the future. If you’re reading this, probably you certainly do. Clubs can be found at the heart of many working class communities offering facilities to their members apart from the obvious ones of providing a place to go to have a pint with your friends. And they have been doing since the club movement, with the help of the Club and Institute Union, began back in the middle of the 19th century. Even if your own club has only been going for 30 or 40 years, there are many others with long and illustrious histories, which are certainly a key part of wider local heritage. I feel very strongly that all of this activity needs documenting somehow, before too many more clubs close their doors for the last time, and this is the task I have chosen to undertake. Clubs, past and present, seem to be at best unrecognised and at worst ignored by those in power. Largely set up by working men themselves as a form of mutual self help, they were mostly left to their own devises. Nowadays as many clubs are struggling to keep their doors open, this is still the case. There is very little help forthcoming. In fact, it seems that legislation passed over the past few years seems intent on helping to shut those doors firmly and thus hasten the decline of clubs throughout the country. Excessive regulation and a refusal to look at the bigger picture of what clubs do for their local communities are part of the problem for many clubs as fewer members volunteer to take on the ever-more time consuming management tasks. Of course times change as well and people nowadays have plenty of other choices about what to do in their leisure time. This was not the case for our predecessors who didn’t have much on offer at all except for the pubs. Clubs do have to compete with many other options in the modern age that much is true. Plus working class communities have changed radically with the loss of local industries. But clubs are still good at doing many things that perhaps government officials just don’t see in their rush to modernise and sweep away what remains of the past. Clubs still provide a place to go for people, young and old, in their free time and for many people this might be the main link to the local community. We often hear about the need to re-establish strong communities and the term ‘community cohesion’ seems to be in vogue. Clubs were about community cohesion probably long before some bureaucrat thought up this expression and have been for well over a century. Yet very few outside the club movement saw this let alone offered any praise. They could still continue to perform local community roles into the future if their past contributions were looked at a bit more closely and how these might be transformed for the 21st century. Yes, times change but does this always mean that everything from the past has to be relegated to the scrap heap without a second thought? You probably care about clubs and their future. I certainly do. This is why I have been spending a lot of my spare time researching clubs, their history, their role in local communities. I have been doing so partly out of academic interest as a sociologist with a deep interest in history but also for personal reasons. It’s sometimes sad doing this research in these times of decline but I firmly believe there is a role for clubs if people, not just club goers, actually recognise what clubs have done and can still do for communities. The fact that you are reading this online is a positive point and the wider use of websites might be one way forward for clubs in the modern age. My own self-designated task is to collect information about clubs in the past in order to see what can continue into the future. 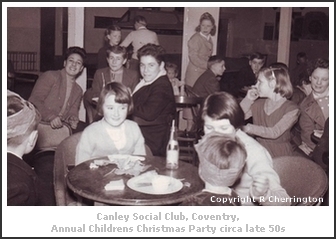 I have been focussing on my own home town, Coventry and have written some local articles about clubs there. But I would like to look further afield.